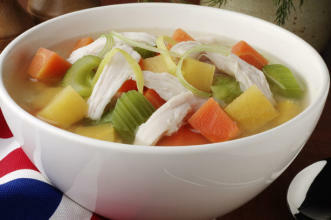 A great chicken vegetable soup recipe for when the weather terrible outside and there is a great film on tv. Draw those curtain, pull up a blanket and feel great. Cut the chicken into loads of peices and put them into a large pan along with the carcass. Add the water and salt and bring to the boil. Cool down and let it simmer on a low heat for about 10 minutes. Throw in all of the other ingredients except the coriander. Cover and simmer for about 2.5 hours, adding salt and pepper to taste. Remove all the scum and frothy bits on top periodicly. Remove the Edible chicken bits after an hour but leave in the carcass. When it is ready, strain and filter the soup to remove the carcass and other bits you don't really want. Squash all of the vegetables and extract as much juice from them as possible before you discard them. Shred all of the chicken bits and out back in with the soup. Add the coriander and serve hot. Delicious!